If your kitchen needs a quick pick-me-up, just changing the sink faucet goes a long way. Start by deciding on a style and finish, but don’t go crazy: it should be consistent with the hardware you already have, or you’ll need to change that, too. Next think about how you use your faucet. If you need to fill large pots, a hi-arc model works well. The pull-down sprayer in some models is pretty handy, especially with a touch sensor to turn it on and off without touching the handle. A bridge faucet will also give you some extra height, and gives a more rustic look. There are models with filters and diverters for drinking water. There’s even a faucet that will light up so you can see the bottom of the pot you’re washing… or get a drink at night without turning on the lights! 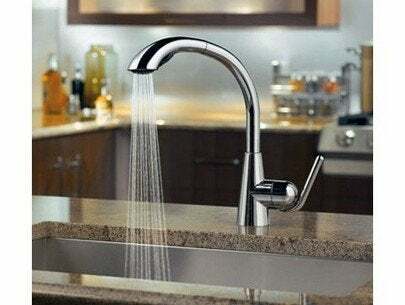 Depending on the faucet you choose and your plumber’s rate, this two-to-three-hundred dollar project could change the way you feel about your whole kitchen!